You have beachfront property and don't even know it in the eyes of Sony's Kaz Hirai. The company's CEO equates the race to outfit consumers with wearable gadgets like the Sony Smartwatch 2 or Google Glass as a zero sum real estate game. "I look at it like a real estate business because you have limited real estate to establish your beachfront," said Hirai, according to the Wall Street Journal. He figures that once that beachfront property has a flag planted in the ground by a manufacturer, the barrier to entry for anyone else is rather high. "Once you're committed to a particular product then I don't know if you want to be switching all the time." Sony isn't the only tech company looking to strap its wearable gadgets onto consumers interested in quantified self. Samsung recently launched its Galaxy Gear and Fitbit added an OLED with caller ID functionality to its Fitbit Force activity monitor. Likewise, Apple is heavily rumored to be launched an iWatch and Google may do the same with a Google Gem smartwatch. "The jury is still out on what the consumer expects from a wrist device," said Hirai. Battery life is a serious dilemma for smartwatches that have limited room to work with. "All of these discussions are still out there. But that makes it an interesting space to be in and a lot of companies are looking at it." Making a cross-platform compatible smartwatch may indeed be the first step. While consumers may want to be locked into a wearable ecosystem, according to Hirai, he suggested that they're more tolerable of switching phones every now and again. 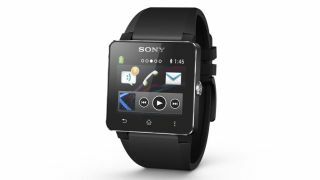 Right now, the Sony Smartwatch 2 and Galaxy Gear are only compatible with a handful of Android devices. Apple's iWatch would presumably stay inside the iOS walled garden. The key to his analogized beachfront "real estate" may be allowing consumers to bring their own operating system infrastructure instead of being limited to one particular choice. Check out the new suspected Galaxy S5 release date.